Growing up in California, swimming is what you do! We had a pool at our house, and our neighborhood had a swim team. My mom wasn’t a strong swimmer, and she wanted my sister and me to have confidence in the water. All the local kids in the neighborhood were part of the swim team during the summer months. We joined the summer team, but did not start on a year-round team until middle school when we moved to Oregon. Starting Masters swimming with the Tankers was a homecoming of sorts, since my club swimming started at the Oregon City pool. It still looked pretty much exactly the same! I swam through high school, but by the end of my senior year I thought I was done with the sport. I always saw swimming as more of a way to stay fit and be social with my “swim team family”. 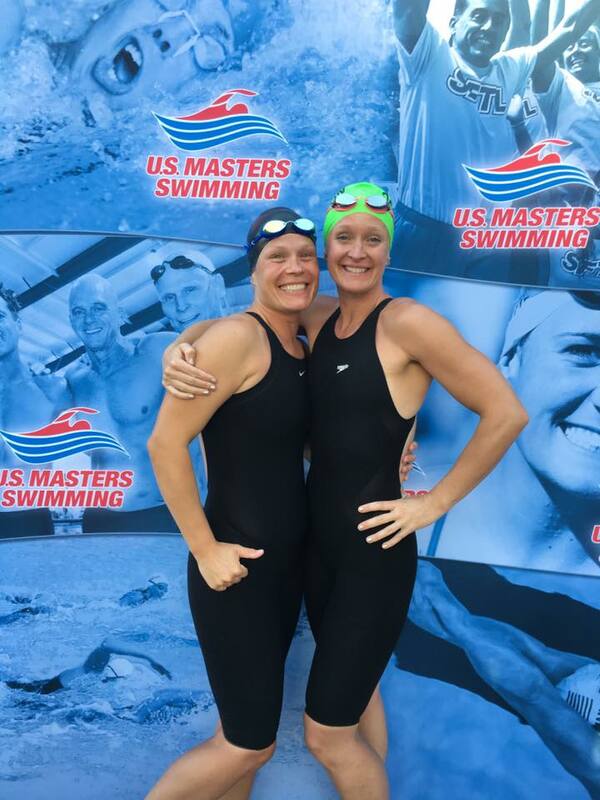 My drive to be competitive with swimming didn’t start until I started swimming Masters! 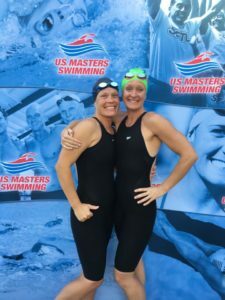 In 2012 my sister Sonja joined the local Masters team in Oregon City. She told me how great it was to get back in the water, and she encouraged me to try it out. I loved it! Swimming makes me feel like a kid again. The team was so positive and welcoming. I remember thinking “how can everyone be this nice!”. That trend has continued. It feels great to have such a solid support system at the pool helping me reach my goals. It has also been super fun swimming with my sister. Sharing the Masters experience with her has been a blast. She is always there to “dork” out over swimming times, meets and other swim related topics 🙂 We always have lots of belly laughs when we take off for a weekend-away swim meet. I am married with two children. My son Everett is 8, and my daughter Devon (also a swimmer) is almost 11. So much of my day revolves around my kids and family. Swimming is all about me and it is my time to be alone. No one expects anything from me at 5 am in the morning except to swim. It is something I do entirely for myself, and it allows me to be a good role model for my kids… like, “see, mom stays healthy and has activities outside of the house”. It definitely helps keep me sane! I love swimming the 200 butterfly. Anytime you swim it you feel like a badass! Regardless of my time I always feel like “holy cow, I just swam 200 yards/meters of fly!” It is such an accomplishment! I love hanging out with my family, running, camping and taking our boat out for water sports in the summer.